Henry the Lion at his wedding to Matilda of England. Illumination from the Gospel Book. The Gospels of Henry the Lion were intended by Henry the Lion, Duke of Saxony, for the altar of the Virgin Mary in the church of St. Blaise's Abbey, Brunswick, better known as Brunswick Cathedral. The volume is considered a masterpiece of Romanesque book illumination of the 12th century. The gospel book was made for the duke on commission at the Benedictine Helmarshausen Abbey. As for its date, the church in Brunswick was built in 1173, and the altar of the Virgin Mary was dedicated in 1188. The creation of the gospel book was formerly placed by most authorities at about 1175 ("early dating") but today the balance of opinion puts it at about 1188 ("late dating"). The manuscript, containing 266 pages with the text of the four gospels, 50 of them full page illustrations, was sold by auction on 6 December 1983 at Sotheby's in London for £8,140,000. The purchase price was raised, in the context of a German national initiative for the preservation of national treasures, by the German government, the Bundesländer of Lower Saxony and Bavaria, the Stiftung Preussischer Kulturbesitz and private donors (largely from Brunswick). It was the most expensive book in the world until 1994, when Bill Gates bought the Codex Leicester, a manuscript by Leonardo da Vinci. The gospel book, preserved completely intact, with 50 full page miniatures, is kept in the Herzog August Bibliothek in Wolfenbüttel, and for security reasons is displayed only once every two years. ^ Fred S. Kleiner (1 January 2016). Gardner's Art through the Ages:The Western Perspective. Cengage Learning. pp. 382–. ISBN 978-1-305-63394-0. ^ Barry Jones (17 March 2015). Dictionary of World Biography: Second edition. ANU Press. pp. 388–. ISBN 978-1-925022-25-4. ^ John M. Jeep (January 2001). Medieval Germany: An Encyclopedia. Psychology Press. pp. 347–. ISBN 978-0-8240-7644-3. Gospels of Henry the Lion: Sale Catalogue, 6 December 1983. Sotheby's, London. 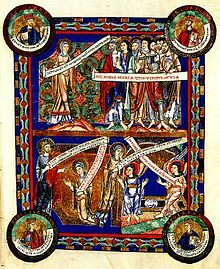 Wikimedia Commons has media related to Gospels of Henry the Lion. This page was last edited on 17 November 2018, at 20:24 (UTC).